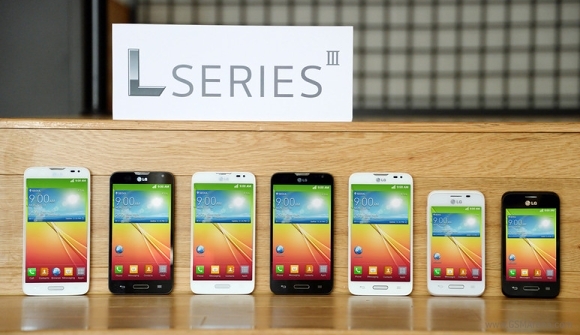 LG announced the L Series III trio of entry-level and mid-range 3G smartphones. LG L90, L70, and L40 will be showcased during MWC in Barcelona with customized Android 4.4 KitKat out of the box. Leading the way is the LG L90. The handset features 1.2GHz quad-core CPU, a gig of RAM, and 8GB of built-in memory. The rest of the spec sheet’s highlights include 4.7” qHD (960 x 540 pixels) IPS display, 8MP main camera, and 1.3MP front-facing unit. Measures of the L90 are 131.6 x 66.0 x 9.7mm. It is powered by a 2,540mAh removable battery. Next in the lineup is the LG L70. It packs a 1.2GHz dual-core CPU and 4.5” WVGA (800 x 400 pixels) IPS display. The rest of the L70’s revealed specs include 1GB of RAM, 4GB of built-in memory, and 8MP or 5MP main camera depending on the market the handset is sold. Measures of the LG L70 are 127.2 x 66.8 x 9.5mm. It packs a 2,100mAh removable battery. LG L40 will be the most affordable member of the trio. Its specs include 1.2GHz dual-core CPU, 3.5” display with resolution of 480 x 320 pixels, 4GB of built-in memory, and 512MB of RAM. Depending on the market it is offered, the LG L40 will feature 1,700mAh or 1,540mAh removable battery. Its measures are 109.4 x 59.0 x 11.9mm. LG released a promo video for the L Series III. See it below. We will be covering MWC live from Barcelona next week, so we will bring you hands-on photos and first impressions from the newly launched LG L Series III trio.